Accompanied by my partner Jane, I travelled by bus from Nairobi, Kenya to Arusha, Tanzania to meet my friend, research colleague, and pancake tortoise expert Reginald Mwaya. Reginald has been studying pancake tortoises, locally known in Tanzania as kobe chapati, for nearly 20 years. 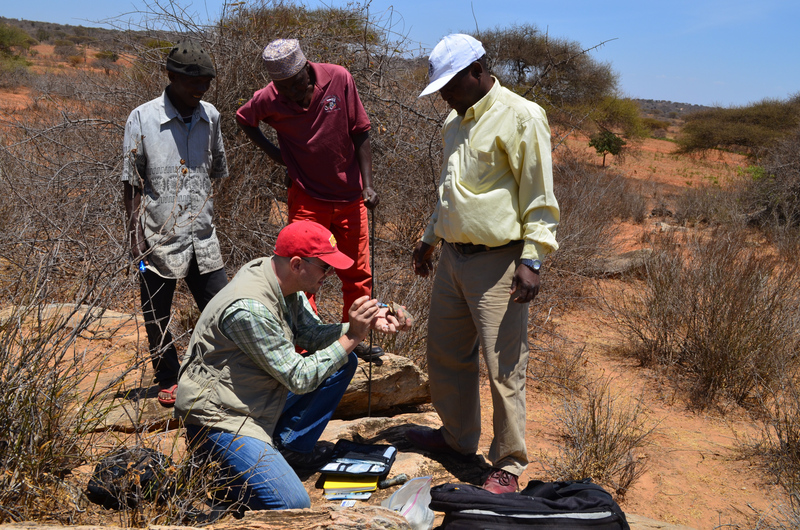 He has recorded attributes from numerous tortoise populations throughout his country of Tanzania as the basis for his dissertation research. Together we collected the first blood samples to be used for genetic analyses of the species. Reginald hopes to gain an understanding of gene flow between pancake tortoise populations that are seemingly isolated among patches of widely distributed habitat; I am interested in reconstructing the evolutionary and biogeographic history of the species across its entire range, which includes Tanzania and Kenya. 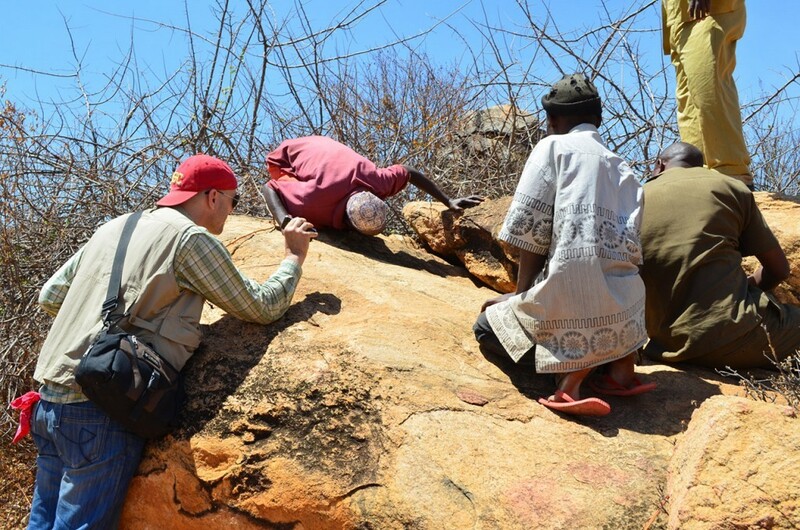 The team examines a rock crevice at Jenjeluse, where we captured a male pancake tortoise. Pancake tortoises, also called soft-shelled tortoises or crevice tortoises, are perhaps the most unique species of tortoise on Earth. As their names imply, they are dorso-ventrally flattened in shape, have soft, pliable shells, and inhabit the cracks and crevices of large granitic boulders. Like many other tortoise species, they sport intricately-patterned shells and eat primarily grasses and other vegetation. However, while other tortoise species are afforded protection from predation by having hard shells, pancake tortoises avoid predation by spending the majority of time wedged tightly into deep rock crevices out of the reach of predators. One of the most interesting aspects of the biology of the species is that they are apparently restricted to rock outcrops formed during the Pre-Cambrian Era. These rocks occur from northern Kenya to northeastern Zambia, and are exposed on the surfaces of isolated hills or kopjes, ridges, and other areas of relatively steep topography. As these rock outcrops are scattered in a patchy distribution across the landscape, so are pancake tortoise populations. What we don’t yet understand is how individual pancake tortoises disperse or travel between these scattered outcrops, or how their apparent geographic isolation among them has contributed to genetic differentiation between populations. Drawing blood from a juvenile pancake tortoise while Reginald and two residents of Jenjeluse observe. Reginald arrived in Arusha with his trusted field technician Joseph Naibana to pick Jane and me up, and together we travelled to Kondoa in central Tanzania. The trip was not easy; we suffered during a long, bumpy ride along a rough road more than 80 kilometers in length, and our accommodations in Kondoa, a small town known for its suspicion of outsiders, were quite primitive. From Kondoa, we could sample two populations within a one-hour drive of town, including one at the village of Jenjeluse and another at Kolo. We set out the next morning, starting in Jenjeluse. There we were accompanied by two men from the village, who observed our work. The pancake tortoise population at Jenjeluse is distributed along a long narrow, ridge where rock outcrops and boulders were scattered. Reginald had previously documented a number of crevices in these outcrops where pancake tortoises occurred. We visited these previously recorded crevices, as well as several new ones, and captured and sampled ten tortoises over a two-hour span. In one crevice, we observed a sleeping African hedgehog. 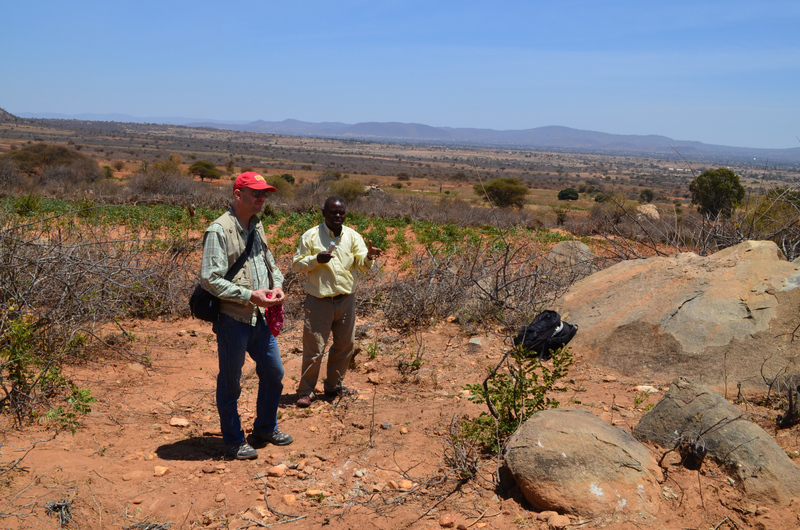 We also observed recent anthropogenic disturbances at the site, including an agricultural plot and evidence of boulder crushing for producing gravel. After wrapping up work at Jenjeluse, we headed back to Kondoa for a quick lunch consisting of rice, beans, greens, and roasted goat before heading to the village of Kolo. The pancake tortoise population at this locality is situated among scattered rock outcrops downslope from the Kolo cave paintings, a World Heritage cultural site. We had just an hour to work before sunset, during which time we captured and sampled four pancake tortoises. 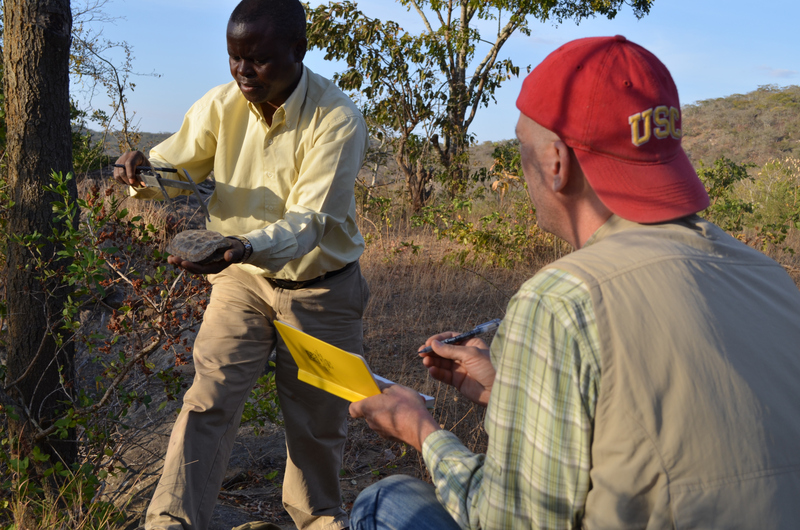 Reginald and I record the measurements of a large female pancake tortoise from Kolo. 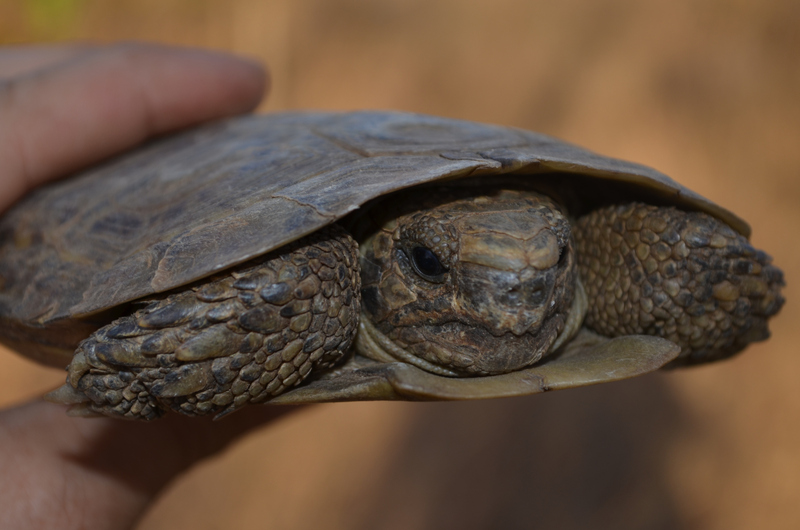 Close-up of an adult female pancake tortoise captured at Kolo. Nihayo tu, kwa sasa, tarajia mengi badaye!